Cabling and bracing trees involves adding hardware to the tree to reduce the risk of failure and prolong the life of the tree. The climate in Denver and be erratic with strong winds and snow while the trees are in leaf. These forces on the tree can sometimes cause severe tree damage to trees that have been mismanaged or that have large co-dominant stems and weak unions. 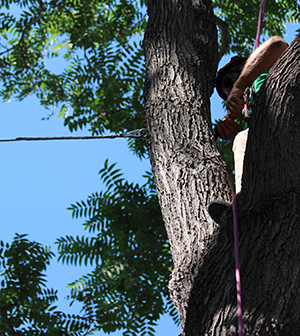 The purpose of installing a support cable in a large tree is to reduce the movement and force on weak branch unions. Many considerations must be considered before installing a support system. Tree species, health, age, size and location are all considered before we will recommend a cable system for any tree. An unsafe tree cannot be made safe by installing a cable. Bracing involves drilling through the tree to install a threaded steel rod. This technique is used to support weak unions and split trunks on smaller trees. Fruit trees that have to support extra weight and multi-stemmed ornamental trees can benefit from this treatment and in most instances will prolong the life of the tree. Donovan Arborists has studied tree structure and can give you an educated, honest evaluation of your tree. Call us today for a free Tree hazard Evaluation.